No need to lug #10 Cans around and be forced to consume large amounts of food in a very quick fashion once opened. Wise Freeze Dried Meats come packaged in Mylar pouches and are stored in a grab and go plastic container. Just add hot water and within minutes you can enjoy fresh, real, seasoned meats. All packaged in 4 stackable buckets. 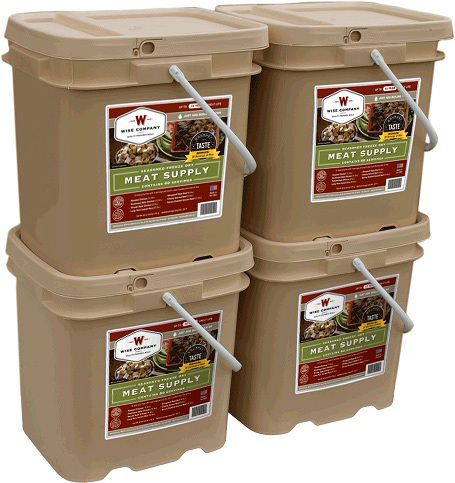 240 servings of assorted gourmet seasoned freeze dried meat + 80 serving bonus of long term emergency rice. Total Servings 320. No need to lug #10 Cans around and be forced to consume large amounts of food in a very quick fashion once opened. Wise Freeze Dried Meats come packaged in Mylar pouches and are stored in a grab and go plastic container. Just add hot water and within minutes you can enjoy fresh, real, seasoned meats. All packaged in 4 stackable buckets. 240 servings of assorted gourmet seasoned freeze dried meat + 80 serving bonus of long term emergency rice. Total Servings 320.